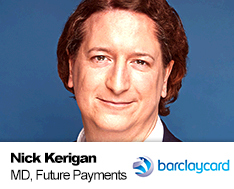 Nick Kerigan is Managing Director, Future Payments at Barclaycard International. In this role, he is responsible for driving innovation globally across Barclaycard International, creating customer and commercial opportunities from the rapid changes in payments. His team is responsible for designing and developing exciting new innovations such as the award winning grab+go. Nick is a seasoned conference speaker at industry events: select 2017 engagements include keynote at The Cards and Payments Summit, Lafferty International Cards and Payments Conference and the Future of Payments Conference. Nick has an established presence as a thought leader in payments as the author of many articles and active on social media.